@Cara-Gregan hi there i just had the same thing happen with bull purchases, so i was looking up in the bull income line, but in fact bull purchases were down hidden under Stock Purchases - Bulls, i thought I was going a little crazy, they were showing in my budgeted stock reccie but not on cashflow screen, hope that helps ? When it comes to a stock transaction, the sale/purchase date determines which financial year it is allocated to. I think in your case the transaction date may be 4 June 2017 but the purchase date of the Heifers would be 31 May or earlier which puts it into the 2017 year (see below). It's important to record the correct sale/purchase date on your actual stock transactions so that you have the correct number of animals at the end of the financial year so keep doing that. When you created the 2018 budget, did you use actual data or another budget as the base for your new budget? If so, everything is copied over including the sale/purchase date on stock transactions. How many years are there in the budget? When you have a rolling budget i.e. there are 2016, 2017, 2018 etc years to a budget, you can remove the stock transaction by selecting the year that the sale/purchase took place and moving into the Livestock screen. However, if 2018 is the only year in your budget, the Helpdesk will need to remove the stock purchase for you. When can't you edit/remove Last Year's stock transactions? If there isn't a 2017 budget (that 2018 has rolled on from) in place, you won't be able to edit/remove the stock purchase dated in May 2017, even though you can see the payment in Last Year section. This is because all budget stock actions i.e. 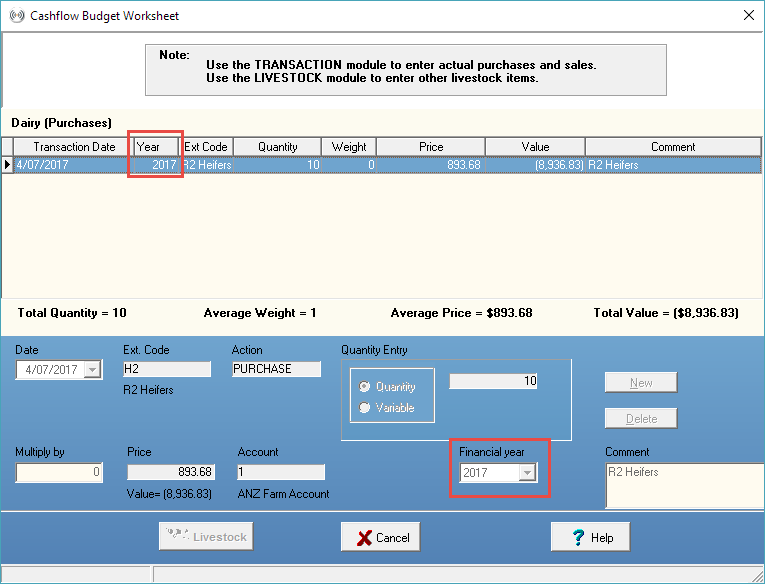 sales & purchases, births, deaths & missing etc, need to be completed in the Livestock module and if the year that the action took place doesn't exist in the budget, the only option is to contact the Helpdesk. *If you use the Cashmanager RURAL desktop version, don't forget to email the above information with a backup of your database. Feel free to phone the helpdesk on 0800 888 080 if you want to talk with the team about it.